5190 ∆ 23 5 Mk. Imperial yacht, fresh colors and very well perforated on magnificent white letter piece with cancellation used in different places \"OTJIWARONGO 6.11.06. \". 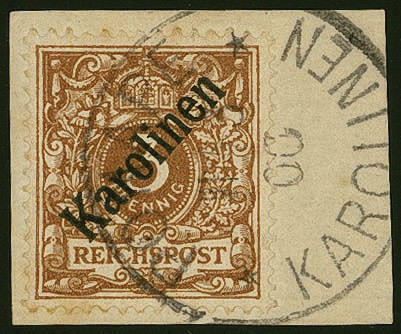 Cancellation used in different places on the key value are very rare to find. A wonderful copy! Expertized Bothe BPP. 5191 ⊙ 32Aa 5 Mk. 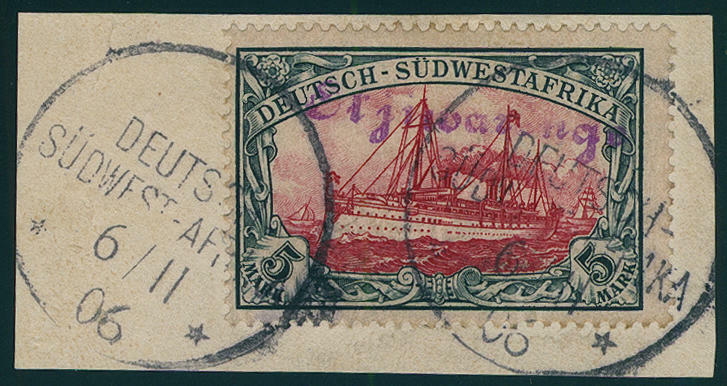 Green black / carmine, watermarked, the complete left half sheet to ten stamps with all sheet margins, fresh colors and very well perforated, at few places slightly separated, neat cancelled \"OKAHANDJA 30.8.12\". All stamps are in perfect condition. Due to the high nominal in the amount of 50 Gold mark it concerns an with this used unit about a spectacular rarity from German Southwest Africa! Photo expertize Meiners BPP. 5255 ✉ Post paid articles of mail cover with clear single circle postmark \"YAP KAROLINEN 18.3.01. 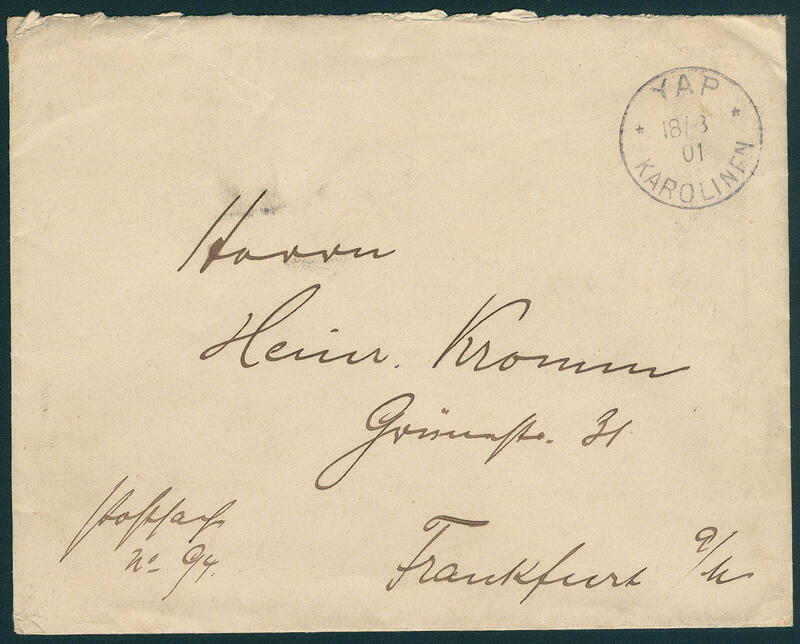 \" with two on the back closure seal \"Imperial German postal service agency YAP KAROLINEN\" and transit cancellation \"SYDNEY 27. AP. 01. 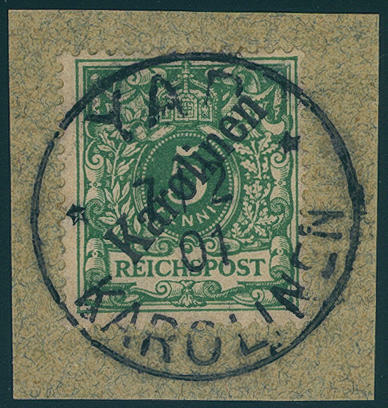 \" to Frankfurt with arrival postmark. There are only few post paid post article letters the Karolinen have become known, and this is a particularly attractive specimen. A rarity of this area! 5239 ⊙ 1I 3 Pfg. Bright orange brown, diagonally overprint, fresh colors and well perforated, clean and on self-formed pages \"PONAPE\" in faultless quality. Photo expertize \"faultless condition\" Jäschke-Lantelme BPP. Michel 850,- €. 5240 ∆ 1I 3 Pfg. 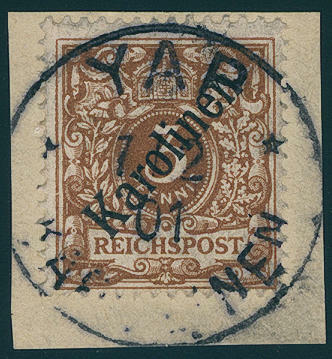 Bright orange brown, diagonally overprint, fresh colors and well perforated on white letter piece, centric and on self-formed pages \"YAP 7.2.01. \". Photo expertize \"faultless condition\" Jäschke-Lantelme BPP. 5241 ∆ 1I 3 Pfg. 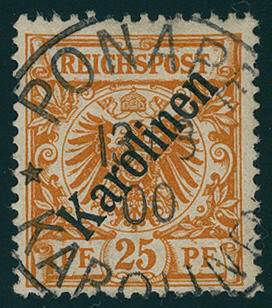 Bright orange brown, diagonally overprint, fresh colors and very well perforated, in perfect condition on piece, date-appropriate and neat cancelled \"PONAPE 11.3.00. \", photo expertize \"faultless condition\" Jäschke-Lantelme BPP. Michel 850,- €. 5242 ⊙ 2I 5 Pfg. Bluish green, diagonally overprint, fresh colors and very well perforated, clean and date-appropriate centric cancellation \"PONAPE 7.1.00. \". Photo expertize \"faultless condition\" Jäschke-Lantelme BPP. 5243 ∆ 2I 5 Pfg. Opal green, diagonally overprint, fresh colors and well perforated on very nice white letter piece, perfect on self-formed pages \"PONAPE 8.6.00. \". A piece of dream for the highest standards! Photo expertize \"faultless condition\" Jäschke-Lantelme BPP. 5244 ✉ 2I 5 Pfg. Opal green, diagonally overprint, wonderful having bright colors outstanding quality on magnificent letter piece, perfect and on self-formed pages \"YAP 7.2.01. \". For the highest standards! Photo expertize \"faultless condition\" Jäschke-Lantelme BPP. 5245 ∆ 3/4I 10 Pfg. And 20 Pfg. Diagonally overprint, fresh colors and in perfect condition on two lovely letter pieces, clean and on self-formed pages \"PONAPE\". Michel 320,- €. 5246 ✉ 4I,6I 20 Pfg. And 50 Pfg. 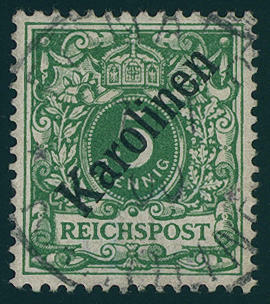 Diagonally overprint in combination with 3 Pfg., 5 Pfg., 10 Pfg. And 25 Pfg. Steep overprint as wonderful \"set franking\", wonderful fresh colors and in perfect condition on registered cover from \"PONAPE KAROLINEN 19.10.00. 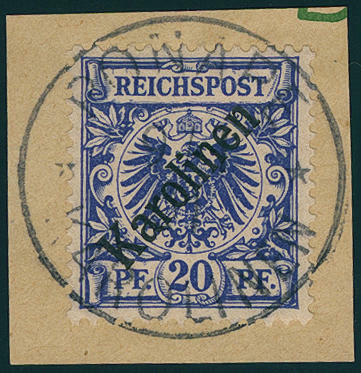 \", each stamp single and perfect used, to Alzey with arrival postmark. A fantastically beautiful letter in perfect quality! Photo expertize Brekenfeld BPP. Michel 4090,- €. 5247 ⊙ 5I 25 Pfg. Orange, diagonally overprint, wonderful fresh colors and well perforated, especially nice clear centric and on self-formed pages \"PONAPE KAROLINEN 13.3.00. \". An outstanding quality for the highest standards! Photo expertize \"faultless condition\" Jäschke-Lantelme BPP. 5248 6I 50 Pfg. 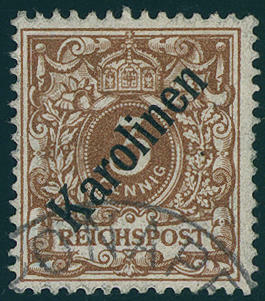 Lilac brown, diagonally overprint, wonderful having bright colors and in perfect condition mint never hinged outstanding quality, expertized Steuer BPP. Michel 1800,- €. 5249 6I 50 Pfg. Bright red brown, diagonally overprint, wonderful fresh colors and very well perforated with gutter extension, in perfect condition unused, almost like mint never hinged causing, expertized Drahn, Bothe BPP with photo certificate. Michel 800,- €. 5250 ⊙ 6I 50 Pfg. 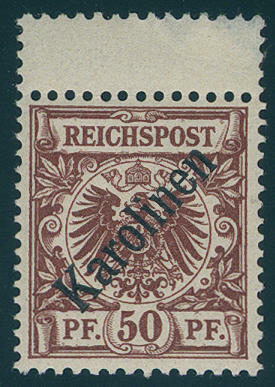 Lilac brown, diagonally overprint, fresh colors and neat cancelled \"PONAPE 18.10.99. 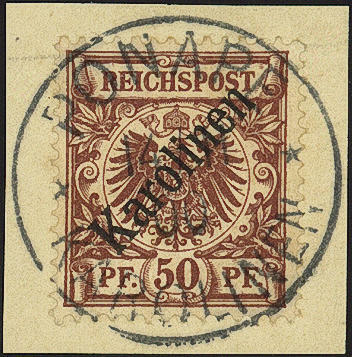 \", used in the correct time before the stamps were demonetized. Photo expertize \"faultless condition\" Jäschke-Lantelme BPP. Michel 1800,- €. 5251 ∆ 6I 50 Pfg. 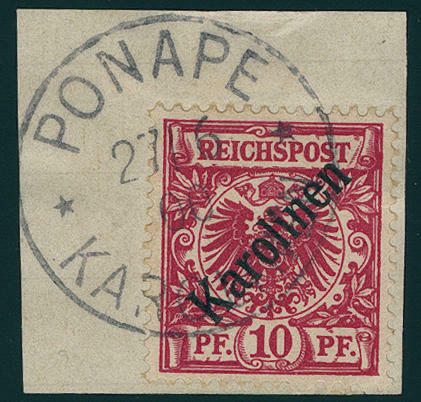 Bright red brown, diagonally overprint, wonderful fresh colors and very well perforated on beautiful white letter piece with centered, pricked clear, date-appropriate single circle postmark \"PONAPE 14.11.00\", an exception copy for the highest standards! Photo expertize Jäschke-Lantelme BPP. Michel 1800,- €. 5252 ✉ 6I 50 Pfg. Diagonally overprint, fresh colors and very well perforated as very nice, a little over franked single franking on registered cover from \"YAP 3.4.01. 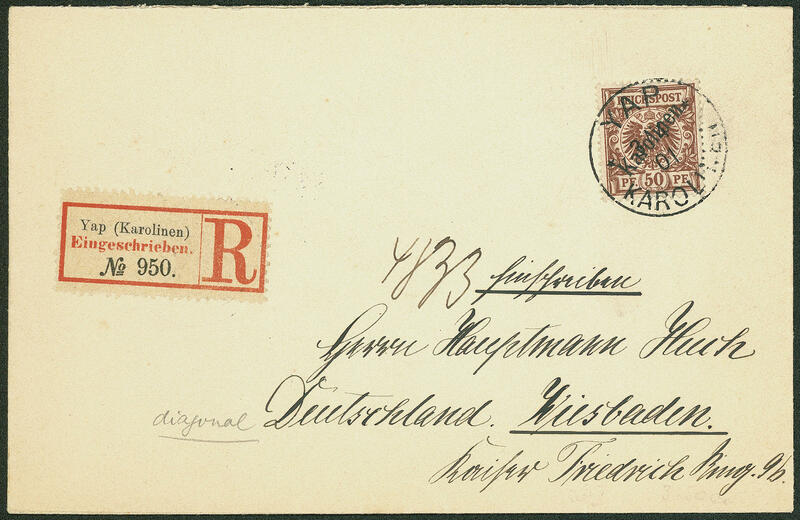 \" to Wiesbaden with arrival postmark. Photo expertize \"faultless condition\" Jäschke-Lantelme BPP. Michel for an over franked cover 3800,- €. 5253 ∆ 10H 20 Pfg. 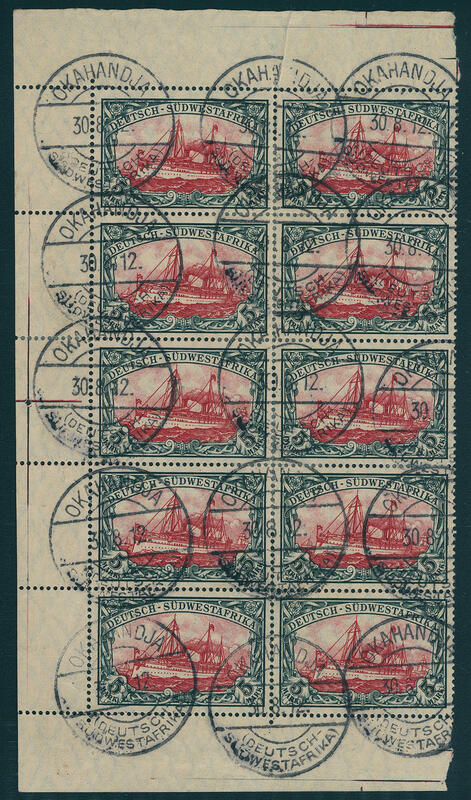 Imperial yacht, vertical bisects (right half), the so-called \"third Ponape provisional\", fresh colors and very well perforated on very nice letter piece with clear single circle postmark \"PONAPE KAROLINEN 12.7.10. 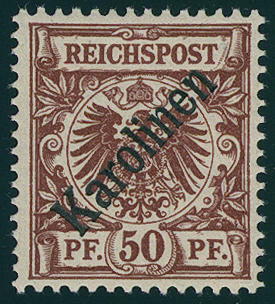 \" and additional seal of office \"imperial German postal service agency PONAPE KAROLINEN\". An outstanding quality this colonial rarity! Expertized Georg Buehler. Michel 3000,- €. 5254 ✉ 10H 20 Pfg. 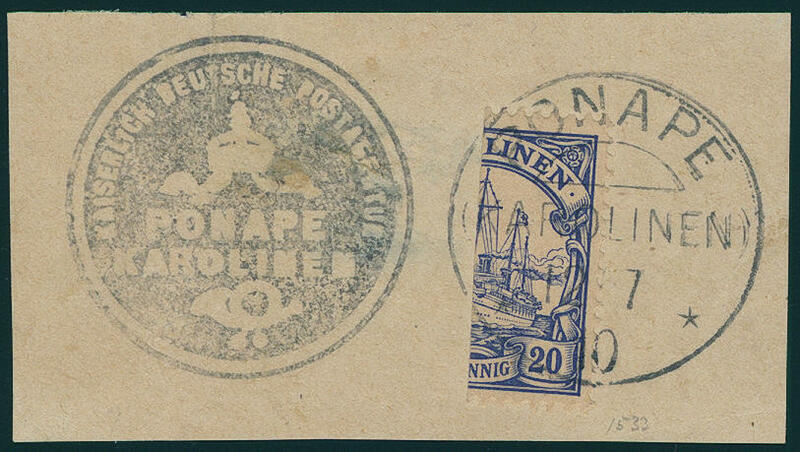 Imperial yacht, vertical bisects (left half), the famous Ponape provisional, fresh colors and well perforated in perfect condition on very nice folded cover with neat postmark \"PONAPE 12.7.10. 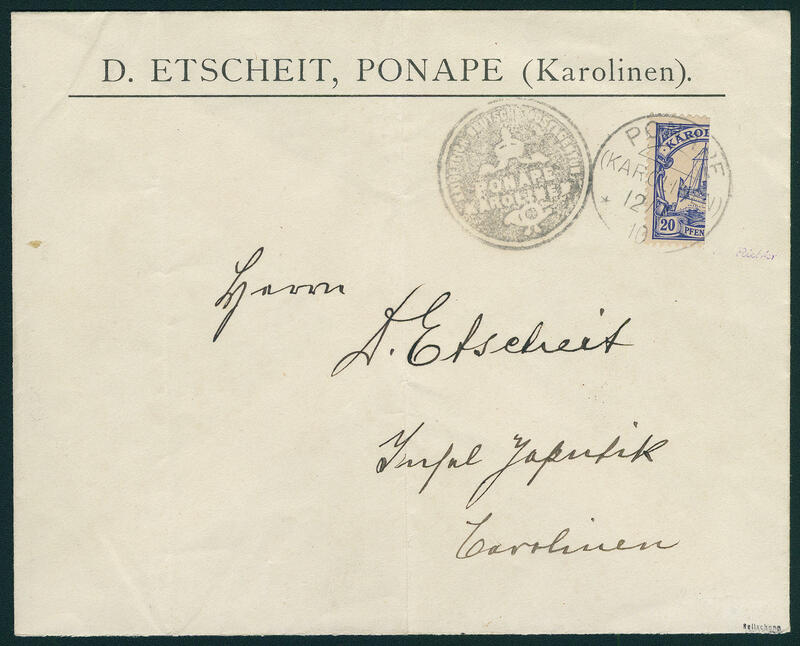 \" and additional seal of office \"imperial German postal service agency PONAPE KAROLINEN\" domestically used. 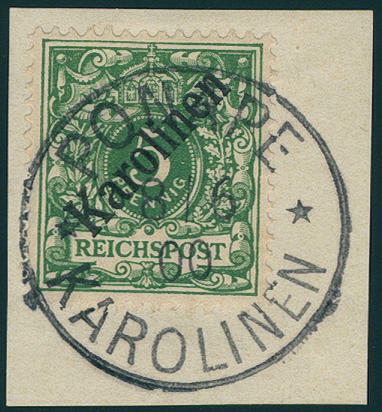 This Provisional arrangement belongs to the rarities of the German colonies. Photo expertize Jäschke-Lantelme BPP. Michel 9000,- €. 5256 ✉ 3II,4I 10 Pfg. 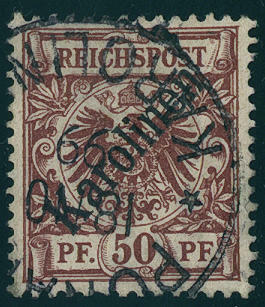 Diagonally overprint, two examples, a value slightly round corner, as well 20 Pfg. Diagonally overprint, all values fresh colors with single circle postmark \"TSINGTAU 20.12.00\" on spectacular franked fieldpost card to buenos Aires / Argentina by registered post with detailed text, transported over Japan with transit stamp from \"NAGASAKI 24. 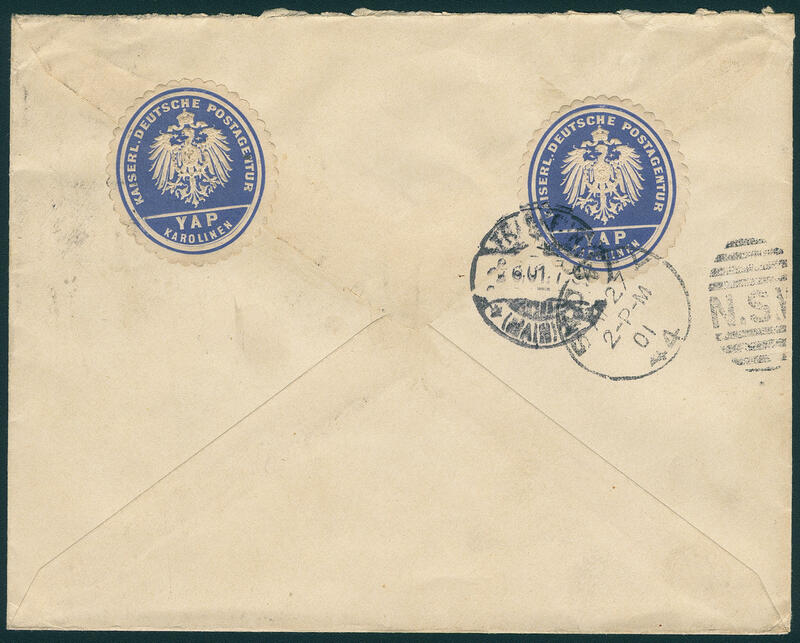 DEC. 00\" and violet two ring cancel \"YOKOHAMA\", as well on the back arrival postmarks. 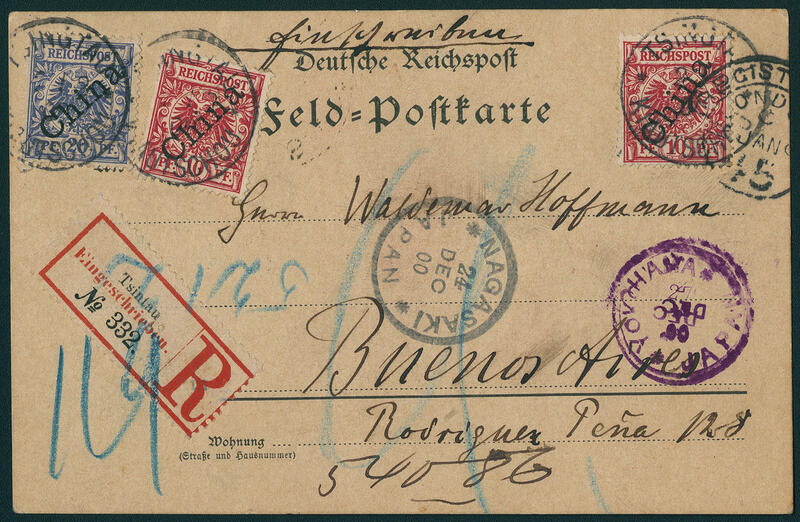 Army postal service abroad was principally liable to postage. An army postal service registered postcard from the precursor time to South America counts to the large rarities of this area. A top piece from Kiautschou, probable unique!